B-vitamins play a vital part in the metabolism of a horse or pony's energy. They are a group of vitamins which are water soluble and are needed by a horse for the metabolism of nutrients . A horse can generate its own B vitamins, which occur as micro-organisms that populate the large intestine. 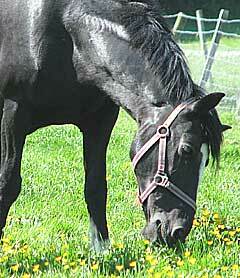 If a horse is fed a healthy diet these micro-organisms can supply all the B vitamins that he needs. Surplus B Vitamins cannot be stored by a horse or pony. B vitamins are only required in small amounts - but if demand for these vitamins exceeds the available supply, or if the horse or pony's hindgut isn't functioning effectively, supplies of vitamin B can be scarce. If there are not enough B vitamins available for a horse he can become easily fatigued, lose his appetite or have problems with poor quality hoof. However Vitamin B deficiencies are not often found in healthy horses fed on a well-balanced, high-fibre diet and receiving moderate exercise. Competition horses in hard training may benefit from being fed a supplement containing a B vitamin complex. Veteran horses with poor teeth that are unable to chew well, or horses recovering from surgery or an illness may also benefit from B vitamin supplements. It is difficult to feed too many B vitamins - because they are water soluble any excess vitamins are passed out in the horse's urine. Diets with high amounts of cereals and / or low levels of forage and fibre. Following a course of equine anti-biotics. Feeding poor quality hay or haylage or feed that has not been properly stored. Eating bracken - this destroys vitamin B1. A horse or pony in hard work or training needs more B vitamins. B Vitamins can be found in commercially prepared horse feeds and equine supplements. Provide adequate amounts of fibre - more than 1% of the horse's bodyweight per day, which micro-organisms in the hindgut will process to supply B Vitamins. Biotin - Increases the production of keratin in a horse's hoof . Folic Acid - Works alongside vitamin B12 to produce haemoglobin and red blood cells. Vitamin B1, thiamin - Used for metabolism of carbohydrate and fat. A horse with a deficiency of thiamin can appear stressed and nervous - for this reason thiamin is often included in calming supplements. Vitamin B2, riboflavin - Found in green hay. Riboflavin is another B vitamin which metabolises proteins and carbohydrates and helps the function of the nervous system. Vitamin B3, niacin - Promotes a healthy skin and a good digestive system in a horse. Vitamin B5, pantothenic acid - Used in the production of antibodies to provide the horse with immunity against disease, also helps metabolism. Vitamin B6, pyridoxine - Essential for metabolism of protein, energy production and a healthy nervous system. Use: Vitamin B2 is vital for the metabolism of proteins and carbohydrates and nervous system function, and is found naturally in leafy, green hay. Vitamin B12 - vital for metabolism of carbohydrate, fat and protein and for healthy enzyme function.